These generously proportioned, durable refuse sacks boast a capacity of around 90 litres. The roll is made up of 15 sacks, each of which comes with tie handles, making it easy to seal and transport the bag once it is full. 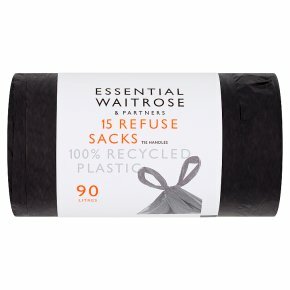 As part of the essential Waitrose range these bags offer value as well as quality, making them a staple for any large household. To avoid danger of suffocation keep these sacks away from babies, young children and pets. Allow hot refuse to cool fully before placing in the sacks. Glass and sharp objects must be wrapped securely before placing in the sacks.